Usually, we cover Gallery Stroll after the fact on this blog to kinda show you what you missed out on, but today, we're doing a little pre-coverage. 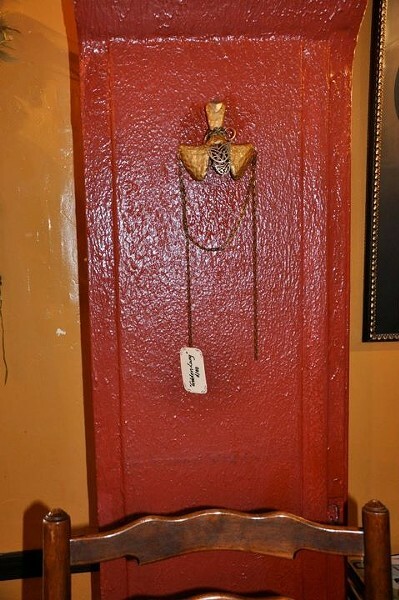 --- The Tin Angel Cafe over on 400 South always seem to have something just a little beyond the norm hanging on its walls for you to check out while you're dining, from jewelry to abstract painting to sculptured wall art. But this month, it has something a little more decorative and with a bit of mystique. 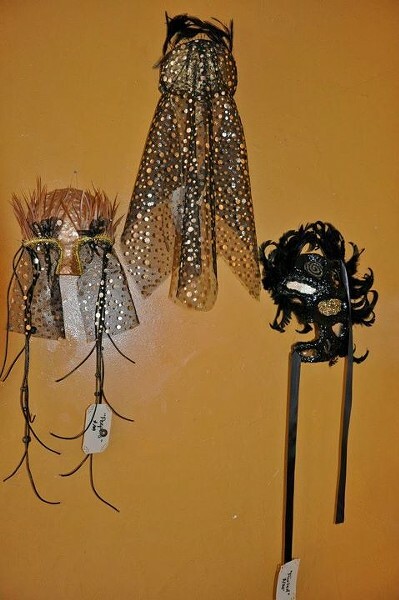 Tara Evicci has been making her own brand of costume and masquerade masks for roughly two years, taking the costume accessory and dressing it up as an artistic piece that can still be worn or displayed prominently in the home. Today, we chat with Evicci about her career and coming to Utah, the masks themselves and her thoughts on local art. Gavin: Hey, Tara. First off, tell us a bit about yourself. Tara: Well, I guess first off, I'm a fine artist. I was born in a rural town of northern New Jersey called Vernon. It's a beautiful town with rolling hills and many hiking trails along the Appalachian Mountains. People don't often think of that when they think of New Jersey. Usually, you hear a lot of the witty remarks like, "What exit off the turnpike are you?" and “Oh, I'm sorry," but the truth is, I feel very lucky to have been from there. It has provided me with a delicate balance. It gave me an appreciation for distinct season changes and gorgeous landscape while having the convenience of being only an hour away from New York City. I graduated from Vernon Township High School in 2003, concentrating in fine art. I spent as much of the school day as I was allowed preparing a college-ready portfolio. I then went on to pursue my Bachelor of Fine Arts at Long Island University, C.W. Post Campus. After participating in their intensive foundation studio arts program for two years, I transferred to the School of the Museum of Fine Arts, Boston. It was there I finished out my degree. I loved Long Island, and also enjoyed my time in many different parts of Boston's suburbs. Gavin: What first got you interested in art and what were some of your early inspirations? Tara: I have been interested in art as far back as I can remember. My parents are actually very talented artists themselves. They have always been very supportive of my pursuing the arts. I remember them taking the time to draw with me as a child. At three years old, I recall my parents using oil pastels. The vivid colors and they way they blended was very striking to my young mind. Those are some of my earliest memories. My first memory of making art was at six years old. My neighbor had taken a Bob Ross "wet on wet technique" oil-painting class. I remember looking at the work my friend -- only a year or so older than me -- had done and got really excited. I wanted to learn to paint, too! I asked my mother if I could learn how to paint, and before I knew it, we had weekly painting lessons in the basement. That year for Christmas, I received the "Bob Ross" kit with all the paints, brushes and knives, the whole nine yards. Looking back, it was a pretty luxurious set for someone of that age! From there, I became very interested in learning macrame. I relished reading "how to" books, teaching myself the different knot patterns, and designing jewelry pieces. I was given a Polaroid camera for Christmas when I was nine, sparking a love for photography. In elementary school, I was always drawing intricate designs around the borders of my schoolwork. Later in middle school, those designs made way to their own paper and turned into compositions of graphite and pen/ink. In high school, I really devoted myself to the idea of art as a life path. I had amazing teachers my last two years of high school. The literature and art teachers I had at Vernon Township High School have influenced me so much and always encouraged me. They never made me feel as if I was making a bad decision by attempting art professionally, but rather that it was THE decision for me. When college began to creep up, I made the decision that if I were to get through school, it'd better be with something I love: art. The art program at VTHS is very well-developed. We were able to do ceramics on site with glazing and firing in the kiln. We could also do raku firing, a unique glazing technique that utilizes oxidation of smoldering dried leaves with the elements in the pigment, resulting in variegated metallic patinas. Many schools would not do this because it is considered to be a high-risk process. I also took photography at VTHS. I learned how to process my own black-and-white prints in the darkroom. I started to mix various media that I was being exposed to by blending ink drawings and watercolor painting with wood and metal elements. At this point, I was very playful in my work; I would often create my own shadowboxes and use nontraditional mounting surfaces such as granite, copper and brass. Gavin: You received your BFA from the School of the Museum of Fine Arts in Boston. What made you choose its program and what was your time there like? Tara: There were a couple things that factored into my choice of the SMFA in Boston. I had just finished two years at Long Island University studying fine art. I really loved my professors there. They were extremely encouraging, very genuine and always pushing me to make the best work I could make. LIU brought me many life lessons, close friends, and an invaluable look at myself as an artist. The art program was structured so that students had to choose a concentration by their second year. This is not uncommon in art programs nationwide. After being heavily immersed in drawing, painting, photography, 2-D, and 3-D work for two years, I found it impossible to make that decision. I felt like it wasn't fair to limit myself artistically, especially so early on. That's when I started looking into various art schools. The SMFA really caught my attention due to its all-elective art program. This meant I was free to choose ANY studio classes across any discipline. This provided the freedom I needed to explore mediums under my own terms. Another deciding factor was the list of impressive alumni including Cy Twombly, Ellsworth Kelly, David Lynch, Nan Goldin, Lalla Essaydi, the Starn Brothers and many others. The review-board process was also a selling point for me. At the end of every semester, you would choose a team of professors and be given a set of students who would critique your work in all classes for the semester. The art school itself had no letter grades. Your passing was based on the written evaluations of your peers whether or not you received full credit for the semester. Location was the final decision maker. I had visited Boston in the spring and fell in love with the city. Its clean streets and vibrant student population was exhilarating. I decided I would make this my new home. Once enrolled at the SMFA, I did what I set out to do and explored many mediums. I honed my drawing, printmaking and ceramic skills. 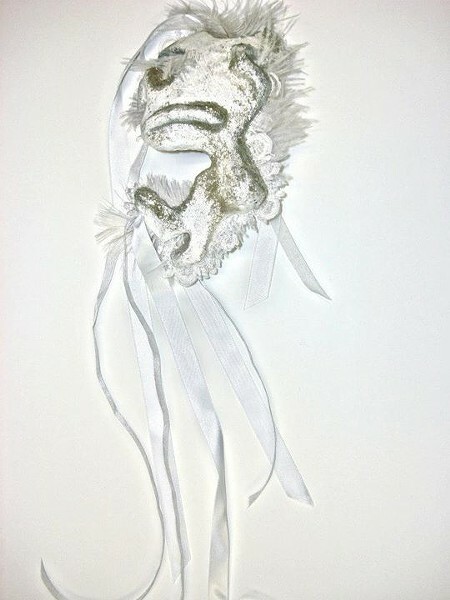 I also dabbled in jewelry making, photography, installation, bookmaking, sound, screenprinting and textiles. Printmaking was probably my primary focus when I first started. Then I took a life-changing course called “Print and Pulp.” This class integrated printmaking and paper-making. It brought a whole new world of possibilities to my work. I have “found” in paper an artistic rebirth. In this class, we were required to collaborate with fellow classmates to make a large (3'x6') sheet of paper. My good friend Gillian Schroeder and I teamed up. This proved to be another “rebirth”! From there, a beautiful collaborative team was born. What originated as a forced collaborative effort spawned into a prolific amount of work. Our first 3'x6' sheet of paper had all the visual qualities of meat: juicy, sinewy, nearly edible-looking paper. That original sheet is what gave us the idea of making seven 3'x4' T-bone steaks out of paper: one for each deadly sin, one for every continent. The size and convincing texture of the pieces greatly related to the human form, and many saw various country/continent shapes in the organic forms of our meats. The meats won the annual “Print and Paper Area Show” that year. Feeling very confident about our first collaborative effort, Ms. Schroeder and I decided to continue with it. Our next set of works involved large Elizabethan-esque paper collars. This set of work involved five “Sensory Collars” depriving the wearer of each of the five senses. The beautifully skeletal-looking collars would sequester one sense in each collar, being careful not to obstruct any other sense but the one at the focus of the deprivation. Preliminary “Sensory Collar Skeletons” were shown at the Apollinaire Theater in Chelsea, MA. My time at the SMFA and in Boston proved to be very rewarding and personally revealing in ways I hadn't expected. I experienced great friends, artworks and ideas. Being there showed me more of the kind of artist I am and how I work in a collaborative environment. I learned that there is immense value in collaboration and it is an opportune moment to learn a lot about yourself in the process. Gavin: What made you decide to come to Utah in 2011, and how has it been for you living here so far? Tara: Honestly, it became a necessity. Boston quickly became too expensive. Living paycheck to paycheck from the beginning of my six-year stay finally caught up and made it nearly impossible to get by. I had graduated and had a decent job, but the struggle to pay bills was consuming. I found that this “just getting by” mentality was wearing on me, emotionally and artistically. I made barely any art for almost two years; that was personally devastating. I needed to figure out the next “big move.” Then, almost as a sign, my boyfriend, Brent Burrow, was offered a job in Utah working with the Schools for the Deaf and Blind. He is a nationally certified “Cued Language Transliterator.” He uses a system called cued language, which is a visual system that represents the phonemes of spoken language. It is used primarily for deaf/hard of hearing individuals, but is also used for learning disabilities like dyslexia. So we packed up and made the 2,000 mile trek in a U-Haul with our car in tow, and our cat -- in a USPS box she called home -- between us. I have loved living in Utah so far. It has been about six months since we moved out. We have been living up in the Heber Valley and it's exceeding beautiful. The enormous backdrop of Mt. Timpanogos is really awe-inspiring! The little town reminds me of where I grew up, so it has a nostalgic feeling for me. Though we really enjoy the wide-open space and landscape, we will be working our way down the mountains to Salt Lake City once the winter is over. Convenience is important to us and I'd like to be more involved in the local scene and experience more great food, concerts and art events. Gavin: How did you first get into making masks and what was the appeal for you? 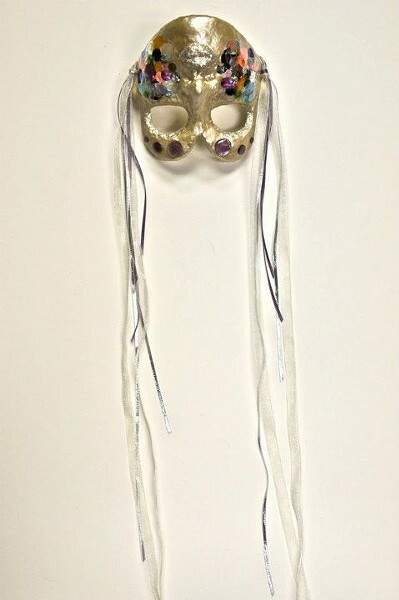 Tara: The beginning of the masks started with the idea of throwing myself a masquerade party for my 24th birthday! I had really wanted to host a themed party where everyone was costumed. My birthday being in May, there aren't a whole lot of reasons for adults to dress up. I figured masks are pretty noncommittal and people would feel less self-conscious about it. So the idea of the masquerade had spawned. Even with masks being a more accessible piece of costuming, I was afraid to just leave it to the attendees. I thought if we held a “mask making craft night” the chances of people dressing up would be much better. The craft night was a hit! I provided the supplies, all the glitz and feathers we would need, and about 15-20 people showed up to create their own pieces for the party a week later. Everyone made really beautiful masks and were proud of what they had done. This really made the party a success and gave rise for many more craft nights to come. Gavin: What made you decide to expand on the idea and start creating masks as your main works? 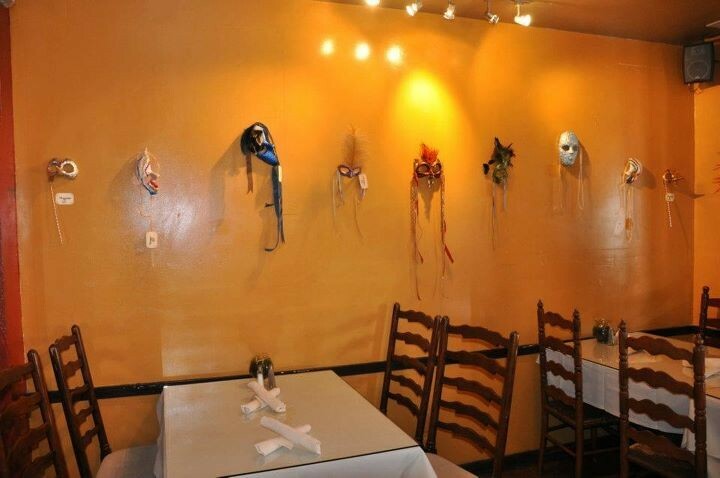 Tara: We had hung the masks we made for the masquerade in our hallway. They looked great and were a great conversation piece when Brent and I had company. 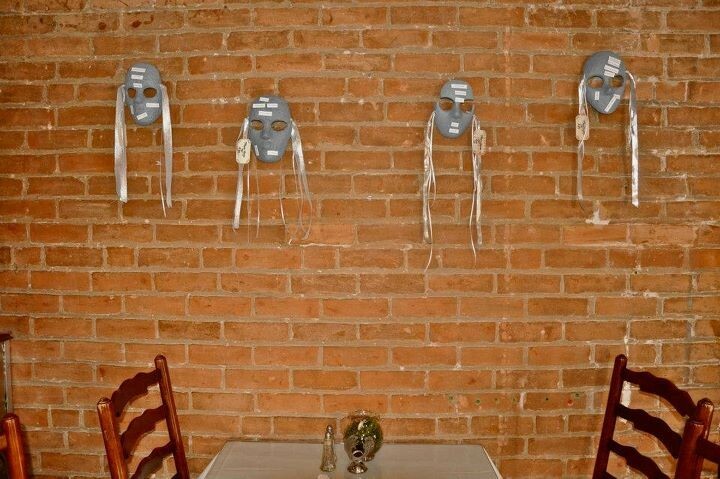 Ever since that masquerade, I have felt compelled to make more masks, but of higher quality. It crossed my mind that I have the chance to transform paper yet again, and in another accessible/wearable way. I had put off the idea for a while because it just seemed too self-indulgent making art with feathers, metallic paints and rhinestones. Considering my art hiatus in Boston, it felt like a misstep to make work that strayed so far from what I've done previously. 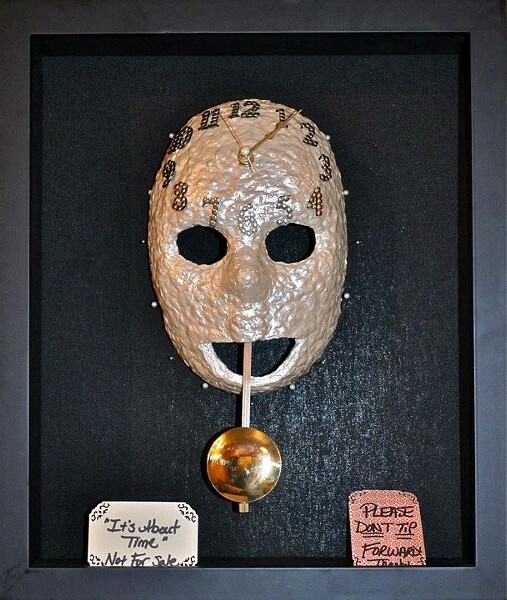 Finally, after moving to Utah, I tossed out my own preconceived notions about my own work/artistic identity and allowed myself to make this mask series. It was liberating to throw myself back into creating and not feel weighed down by intellectually scrutinizing every mark I made. It felt natural and unencumbered, which is exactly what I needed. I've always had an interest in fashion, and more recently, a growing urge to learn costuming and millinery techniques. 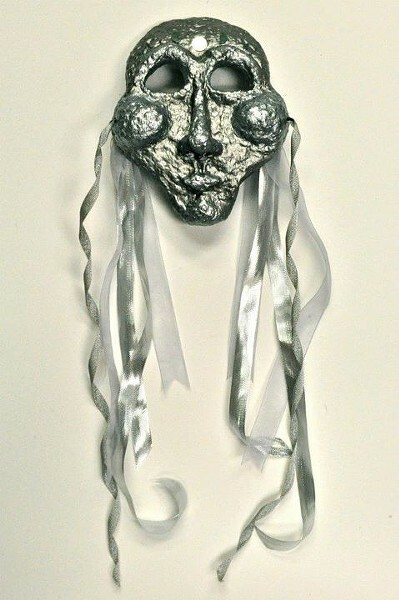 Making masks is a form that I could easily experiment with, especially with my limited resources. Old newspapers are about as cheap -- free -- as you can get! 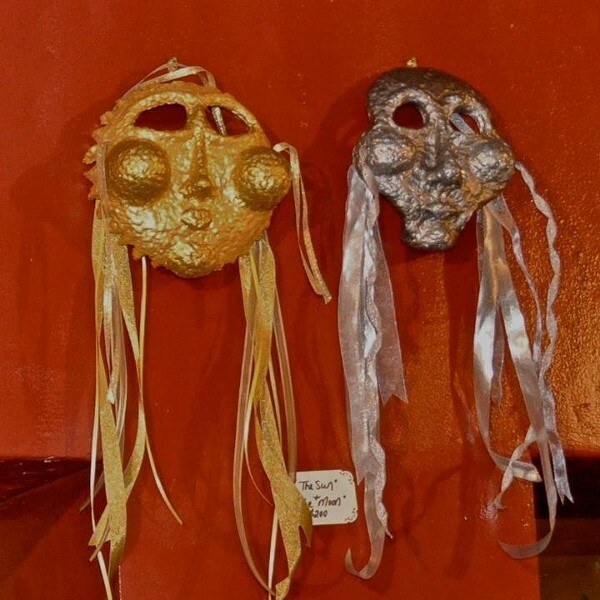 As I considered masks, it seemed like an affordable and inherently relative way to integrate my own artistic trends of 3-D, wall-mountable, and wearable art. Gavin: What's your process like when creating a new mask, from concept to final design? Tara: First thing is first making the paper mash. I wanted to be as inexpensive and “green” as I could in the production of the mask bases, so I used old newspapers. I happened to have access to a huge stack in the garage, so I used that. Making paper is a process of breaking down fibers -- other paper, fabrics, plants -- in water to the point of dilution, allowing one to reconfigure the fibers. These fibers can be recombined in sheet forming or molded into three-dimensional forms usually using armatures. Once the paper itself is made, I start on base formation. Forming the bases is really the first step toward concept realization, which may or may not be predetermined. I choose whether I want a realistic-looking face, a pointy nose, cherub cheeks, etc. I then use mannequin faces and cheap plastic craft masks to build the molded paper up to the shape I desire, then let it dry. From there, I gesso the masks with several layers to make them sturdy and accept paint more evenly. Once the gesso dries, I pick the base color and begin to take stock of what materials I have to decorate with, and that's really where the fun starts! Gavin: Considering the art form, do you like to play around with the look of each mask before you finish, or are you usually set on how it will look when you start? Tara: This project was half and half, I'd say. Certain masks were reactionary; made of choices that were results of previous formalistic decisions within the mask. 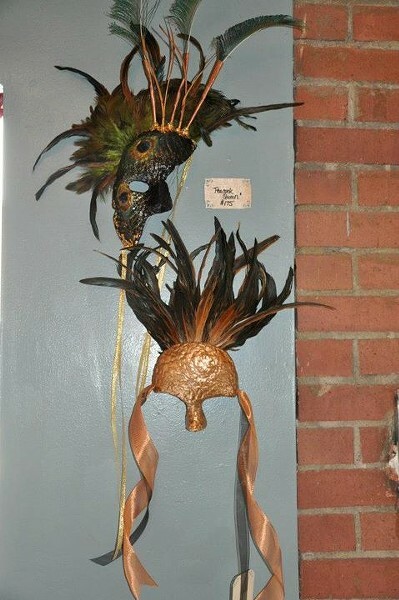 Examples of instinctually made masks would be “Bird of Paradise,” “Golden Lung,” "Keepin' it Classy," “Fierce,” “Islander” and “Copper Mind,” to name a few. 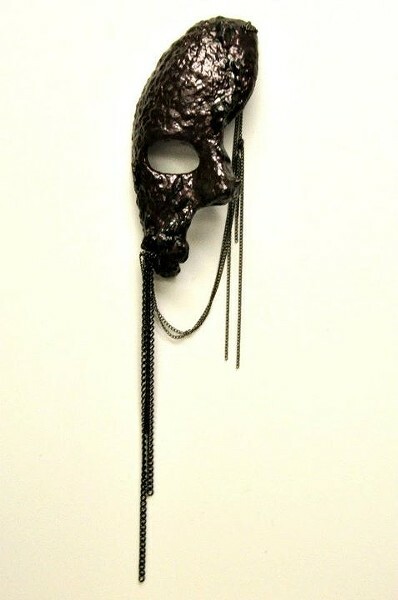 Then there are masks that I had concepts of before production. "Black and White Swans" I set out to do after I finally watched Darren Aronofsky's Black Swan. The movie hit me hard, as all his films do, and I felt compelled to make masks that reflected those dual personalities. 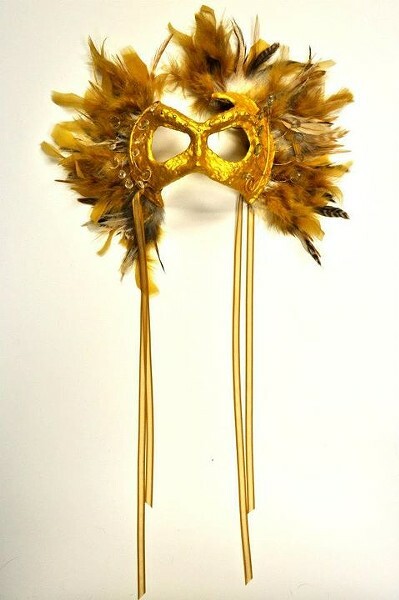 “Peacock Queen” and “Discoteque” were attempts to recreate a more durable version of the original masquerade masks that I had made for the party. Though they are quite different, one can see obvious similarities in them. Others were a mix of the two methods, like “The Moon.” Once I finished the piece, I said to myself, “You know, this one is 'The Moon '... I guess now I have to make 'The Sun'!” Same thing happened with “Warrior-His” and “Warrior-Hers”. With the magnetic masks, I wasn't sure what they were going to say, then the idea came about that they should be conversing. So one says, “Where is the bathroom?” and its partner says, “I don't understand.” The other set is “Where are you from?” and “Far away!” They all feature five magnets saying the phrases in various languages, pointing out the lapse in communication. Gavin: With this exhibition you created 50 different masks. Was there any particular theme behind them or the set as a whole? And how long did it take you to create all of these? Tara: Considering the timing of the show, it is a celebration of Mardi Gras -- the carnival celebration of the last feast of fatty, delicious foods before Lent. 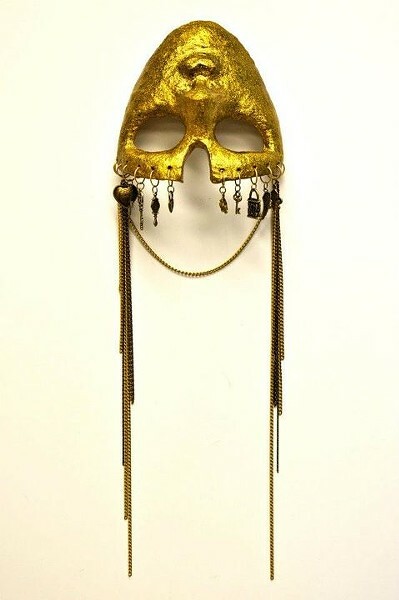 Masks, along with the human fascination to transform/disguise oneself, have significant historical importance and longevity, dating to 7000 BCE. Styles and uses have varied greatly throughout history, but one thing remains: Where there are people, there will be masks. 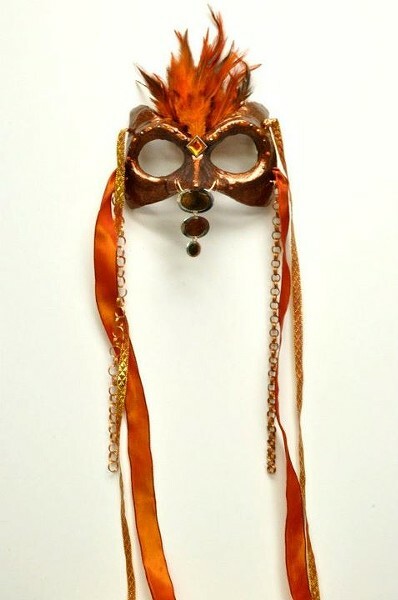 Cultures worldwide have utilized masks to protect their face, identity or even freedom of expression. Throughout Europe, laws were passed to outlaw mask wearing beyond certain holiday celebrations due to a spike in criminal activity. Mardi Gras is the Untied States' most widely celebrated, contemporary event that encourages wearing masks. 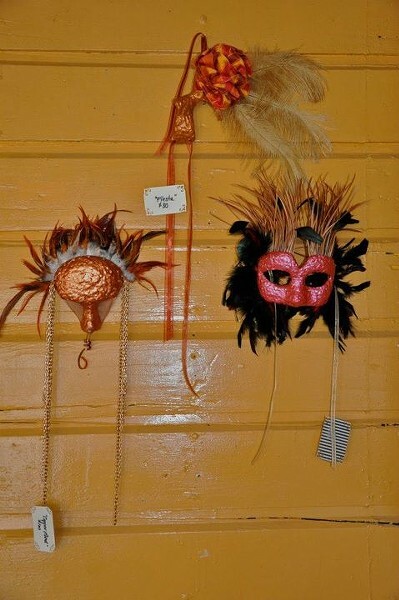 Due to the use of masks in fashion and charity masquerades, they are facing another renaissance, to my great pleasure. Each mask took about 3-8 hours each, depending on the complexity of the design. Long days with many hours were spent. I have been preparing artwork for this show for two months, I feel like I got a lot done! Gavin: What made you decide to do your first Utah exhibition with Tin Angel rather than a formal gallery? Tara: The decision was a wonderful happenstance. Brent and I were waiting for a friend to finish up his shift at the Tin Angel and we were waiting outside. As we waited, owners Jerry and Kestrel Liedtke came to sit outside on the patio and enjoy their “work is over” libations and urged us to do the same. So, conversation flowed, and Kestrel mentioned that they were always looking for artists. I -- politely -- grilled her about what they normally show, price range, media, etc., and proposed the idea of making masks for them. They loved the idea and urged me to get in contact with Robin Fairchild, the other owner at the Tin Angel, who schedules the art/music. The rest, as they say, is “history.” Had Jerry and Kestrel not showered us with the genuine warmth and kindness they had that evening, being so new to town, I probably would not have known to pursue the Tin Angel as a showing opportunity. I'm so thrilled with the way things turned out! 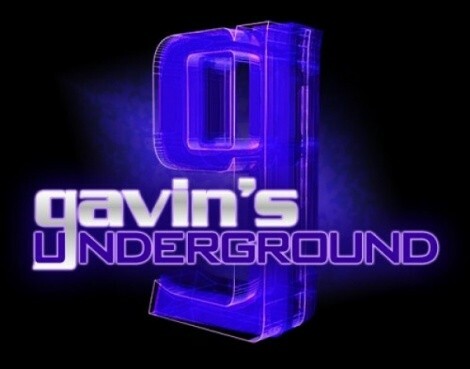 Gavin: The exhibition has been up for a couple of sweek already and will go into March. What's the public reaction been like so far? Tara: I'm really pleased! The opening was an awesome opportunity to see and hear people react to my work. I've been in many critique situations over the years and really enjoy the aspect of hearing people's unabashed opinions. It's even more gratifying in an opening setting when people are there just to see you. Seeing peoples faces and hearing their reactions is a real highlight for me. I am new to the area, and it's really awesome to share what I do with the people I've met. You can tell someone all day that you're an artist, but having them experience your work is something entirely different. It's nice to share what is important to me with the people who are important to me! “Word on the street” says the public is receiving the show very well and that people are talking about it. I think the best thing for an artist is conversation. When the dialogue is open, the work takes on a life of its own. Who knows where that can lead? It's very exciting! 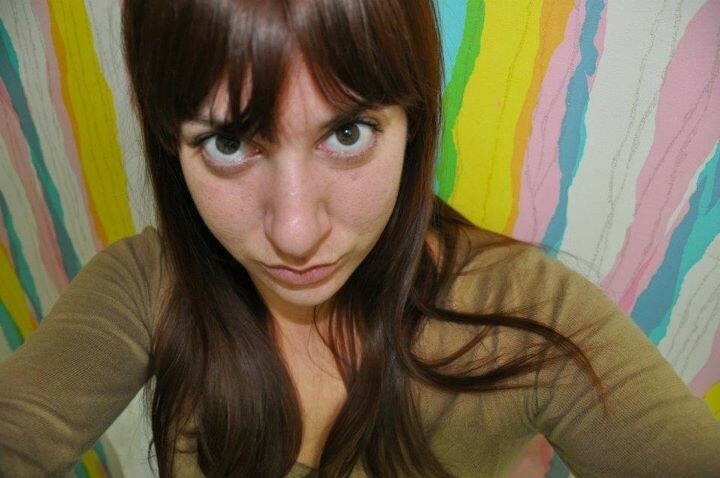 Tara: So far I am nothing but impressed with the local art scene! I definitely had my doubts; coming from out East, there's a kind of elitist attitude toward other art communities. New York City is pretty much the epicenter of the modern art world. I had heard people say that there is a thriving art scene in Salt Lake City, and being a bit of an East-coast “snob” I brushed it off as, “Yeah, yeah, yeah.” To my delight, I have been proven wrong. There is a flourishing scene here that fosters a plethora of fine dining, music, film, dance, fine arts and crafting opportunities. People here are also very supportive and encouraging of artists. Gavin: Being relatively new to Utah and the SLC art scene, how would you compare our scene to Boston's? Tara: One of the major differences that I have noticed off the bat is the great artist-to-artist relationships here in Utah. Artists seem connected in a way that is very supportive of one another and less of a competition. This is in stark contrast to the Boston scene. I think it's extremely admirable and believe it breeds a more positive and even more productive environment. There seem to be less boundaries here in Salt Lake, giving artists the freedom to walk a line of fine art and craftiness. That line is a clear one in Boston, and I think people are less likely to sway between the two there, which I personally dislike. With few exceptions, Boston is old-school. There are old buildings, people and money. With that comes a kind of mini-aristocracy. These people are partial to traditional artforms and love, love, love painting. Many galleries are geared toward the elite and are filled with still life and landscapes. Don't get me wrong; there is a lot of fantastic work coming out of Boston. I just feel like Salt Lake's freedom from genre-binding notions is one of its high points. One really fabulous venue to see some current art in less traditional mediums in Boston was SoWa and First Fridays. These events invited the public to openings every month, and in the case of SoWa, every Sunday, too! When openings are as highly publicized as those are, it's good for everyone. The public benefits and so do the artists, and it creates a more culturally enriched environment all around. Gavin: Is there anything you believe could be done to make things more prominent? Tara: As you pointed out, I am still relatively new to the art scene, so I feel like I can't make any pressing judgments on it. I feel like the state is doing a good job of building up the scene with grants and programs specifically geared toward the arts. Providing funding and incentive to artists will certainly perpetuate the positives that the Salt Lake City art scene is already experiencing. They are getting the word out there through monthly updates on events and social networking, which is at the core of any art scene's survival. Gavin: What's your take on the craft scene in SLC and what do you think of the work coming out of it? Tara: I absolutely love it! 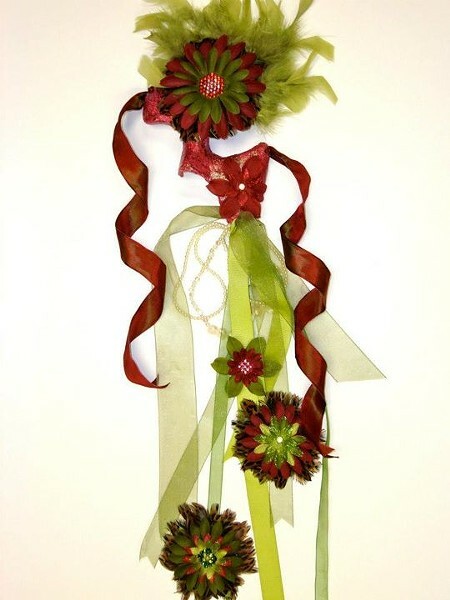 I personally have always had a crafty sensibility and love handmade items. I'm really happy to see it prospering. Right after moving to Utah, I was able to go to Swiss Days and Craft Lake City. Both were very impressive spreads. I took a million business cards; I would love to own it all! Craft Lake City 2011 really blew me away. One of the last artists who I saw that day was Laura Besterfeldt. I was super-impressed with her silver food-inspired jewelry. There were lots of handmade soaps and body-care products of great quality that I loved including the Beehive Soap & Body Care LLC, and Kate Dean Hand and Body Lotion. A lot of beautiful graphic work caught my eye including Scatterbrain Tees and Paper Wasp. 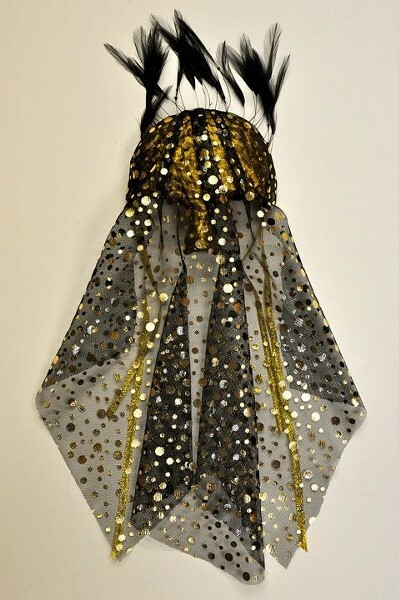 My favorite clothing/accessories was from an artist Jessi Eskelson of Salt City Designs, I still have to buy one of her gorgeous “string cowls”! Steampunk wares always appeal to me, and I really enjoyed Punkenstein Jewelry and Dreamland Sideshow's goods. Upcycled online had a lot of clever upcycled products, but beyond that I appreciated the community it is supporting. If you are an “upcycler” -- I think we all should work towards being one! -- this site helps connects manufacturers, shoppers/artists, retailers and everyone in between who are looking for materials and ways to sell their goods. Another really great cause at Craft Lake City was the Kaberamido Cooperative, which is working to “uplifting the quality of life and economic circumstances in Kaberamido, Uganda” by providing women there with opportunities to make “Berr Beads” as a means of sustainability. Really impressive stuff! Tara: It's hard to say -- there's s lot to get underway this year and the year is young! I plan on getting my Website up in the next few months with a gallery of all the varying media I've worked in so I can be more accessible to people. There will be an Esty shop opening coming soon so I can still be making/marketing in between showings. I have a few applications up my sleeve for various formal galleries that I will be submitting to in the next month. Hopefully, that will provide more exhibiting opportunities for me within the year. I plan on applying to the Park City Kimball Arts Festival 2012. I will certainly be pushing paper further in my work. More wearable paper art will be coming out, for sure. I'm also interested in starting up a public paper studio, but need to do more research on that possibility. I'd love to have space to make tons of paper work and have a place where people could use it as their own studio time or even take workshops. Tara: Yes! The obvious is Tin Angel, especially before March 4 to see the show! 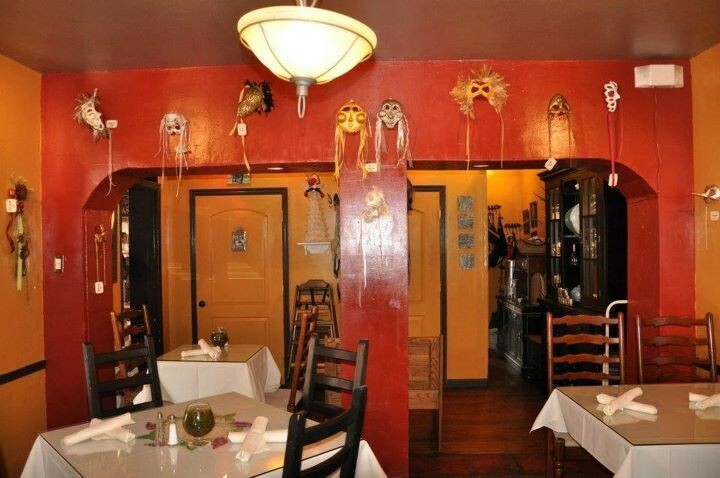 The owners, staff, food, and environment are all fantastic. I really can't say enough about how great Robin Fairchild has been to work with; it's really been my pleasure! A great philanthropic foundation here in Utah that I'd like to promote is the George Q. Morris foundation. The foundation provides grant funding to various organizations promoting the arts. Trustee Robin Woods has ensured that children from low-income homes have the ability to access cinema as an artform through the “Big Picture Little People” program. Thriving after seven years, this program is just one “small” example of the impact George Q. Morris Foundation has had on the community. I would also like to plug an amazing business called SensaLearn. SensaLearn is a booming Utah company that provides tutoring and services for individuals with dyslexia and related learning disabilities. SensaLearn is more than a reading program, it is a comprehensive service provided by highly trained experts with cutting-edge curriculum to close the reading gap. If you or someone you love struggles to read, or you are in academics, please check out SensaLearn.org. Lastly, but by no means least, I'd like to tell your readers to check out Levi Rounds, winner of two City Weekly's Arty's Best Comic in Utah. Check out Levi's Facebook to be on the up and up about upcoming shows. He's a hilarious man, you won't want to miss ANY of his shows!